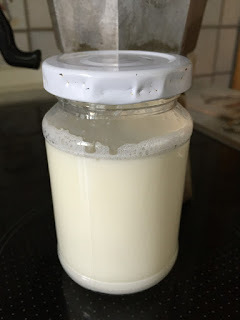 Homemade yoghurt is so easy and my base for so many other homemade basics. All you need is two ingredients. 1 cup of organic natural yoghurt with live cultures. Bring your milk to boil in a saucepan, stir often and do not walk away! Once it has boiled for a good two minutes, put saucepan to side and let cool to roughly 37-40C (it has to be below 42C, otherwise you kill your cultures if you add the yoghurt while still too hot!) To check the temperature without a Thermometer just use your clean finger, if it feels very hot, wait, if it feels just a tiny bit hotter than your finger, go ahead! I have an old early 80s yoghurt maker that I got second hand, but my MIL makes her yoghurt in a saucepan, so I´ll give you both methods. There are different type yoghurt makers, ones with several little glasses, and ones with one big one. Mine has 6 little glasses, that hold together 1 litre of yoghurt. In each of those glasses I put 2 teaspoons of yoghurt, fill them up with the milk once it has reached 37-40C and stir well. Screw lid on and put in yoghurt maker. Set for at least 12 h. After finished refrigerate. They keep for 2-3 weeks. When using save the last yoghurt to make new yoghurt, and just proceed like above. You will never run out of yoghurt and get 6 organic homemade yoghurts (if you use organic milk and starter yoghurt) with no additives for the price of a litre milk. Yoghurt can be your base for so many things. I make our cream cheese out of it, and as a side product get homemade whey. Which you can use for starting your own ginger bug for soda making or use it for bread baking. I use yoghurt for a salad dressing that will keep a week in a screw jar in the fridge, as a dessert, or in ice cream... Really the list is endless! If you have no access to a yoghurt maker you could make it my MILs way. You let the milk cool down to just under 40C and leave it in the sauce pan add your cup of yoghurt and stir well. Put the lid on the saucepan and wrap it in big towels and Blankets (lid and all around) and leave it on a heater or other warm but not too hot place over night ( roundabout 12 h). Thank you Jenny! The cream cheese is already written, I just need to make some pictures when I make the next batch.